Meal plans for kidney disease management differ somewhat, depending on whether or not a patient is on dialysis or not; but all focus on reducing the "load" on the kidneys and on avoiding the buildup phosphorus and potassium, which can be dangerous in excess amounts. When patients are not on dialysis, they will likely be advised to limit their protein intake to no more than one gram a day per kilogram of body weight. Once patients begin dialysis, they may be advised to eat 8 to 10 ounces of protein every day. Pork, poultry, fish, eggs, high-protein powders and/or other food sources like egg white powders may be recommended to make sure patients get enough protein. Many breads, grains, and low potassium fruits and vegetables are good sources of carbohydrate that can provide energy and calories, and can also provide important minerals, fiber and vitamins to patients. Fats can provide much-needed calories, and should be mostly monounsaturated or polyunsaturated; good sources include canola, olive, and safflower oil. Patients with kidney disease must greatly restrict salt and sodium. This can most easily be done by avoiding processed foods and focusing instead on whole, fresh foods. Certain plant foods like beans provide good protein sources, but are often high in phosphorus, as are many dairy products like hard cheeses. These should be limited or avoided altogether. Potassium, too, must often be limited, which also means many fruits and vegetables must be limited or avoided. In some cases, potassium can be "leached" out of favorite fruits and vegetables by soaking/cooking foods in water first. Again, limiting salt, as recommended above, will also help maintain proper fluid balance in the body. Include high-quality protein at every meal. If not on dialysis, patients may be advised to limit their protein to no more than a gram per kilogram of body weight per day; thus, a 150 pound (68 kg) person should be getting about 68 grams of protein per day. 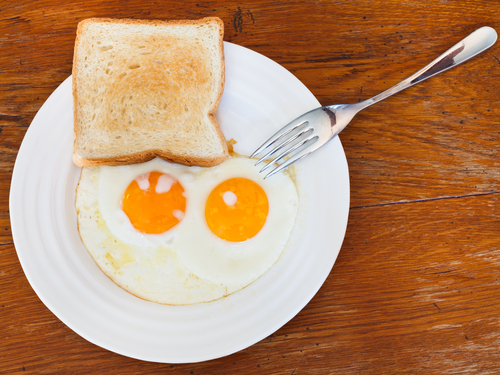 A large egg contains about six grams of high quality protein. It shouldn't be difficult for patients to get enough protein as long as they also get enough calories. If necessary, dietitians may recommend that patients supplement protein intake with high-protein shakes to get the required amount. Good carbohydrates for kidney disease patients include rice, refined (rather than whole wheat) bread, fruits like apples, which are lower in potassium, and most other refined flour carbohydrates. Focus on monounsaturated and polyunsaturated fats, and limit animal fats. Peaches, cherries, pears, berries, apples, tangerines, pineapple, plums, and watermelon. Cabbage, broccoli, celery, carrots, cauliflower, cucumber, eggplant, peppers, green beans, lettuce, onion, yellow squash zucchini. Two eggs (or egg whites) and a slice of white toast; mixed fruit medley including grapes, peaches, apples, and pears may also be added. 4 ounces of pork, white rice cooked with low-sodium chicken broth and chopped onions and garlic, and broccoli. Patients may break down three meals into six smaller ones, including snacks, to get enough calories if needed. Polyunsaturated and monounsaturated fats can be an easy way to boost calorie intake.